A few months ago, I had the most amazing moment of my life. I saw our baby move. 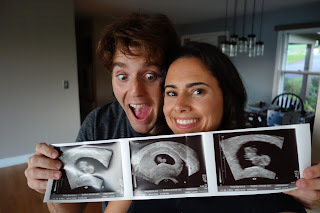 WE ARE HAVING A BABY!!!!!!!!!!!!!!! Wow…We are having a baby. While holding Emma’s hand during the ultrasound at the hospital...we witnessed our child move for the first time. Seeing that little figure squirm around the black and white screen made the thought of becoming a parent so incredibly real. And as I stood there in a blissful wonder, a wave of emotion hit me like I’d never felt before in my life. It was an amazing moment. And then I looked at my beautiful wife. And the smile that she had on her face while gazing at the screen was one of those rare moments in life that you know you’ll remember forever. It was mom meeting her baby for the first time…an introduction to a beautiful journey they would take together over the next several months. She deserves that smile more than anybody that I know, and I fell more in love with her in that moment than I ever thought was possible. In my moment of bliss, the second I saw that glowing smile I became instantly more contented. My joy was in witnessing her insatiable happiness, and I was grateful to share in that moment with my soulmate. After a few minutes of being in awe, it sank in that we were finally starting a family. And another wave of exhilaration swept through my body knowing that my child was going to have Emma as a mom. I can’t wait to see her in that role. She is going to knock it out of the park. Like, Grand Slam out of the park. I know because I am able to see the goodness inside of her every day. I see a strong, independent woman who is so incredibly talented, driven, and kind. I see a person who cares so deeply about others. I see an incredible role model for our future child. And although her genetics don’t exactly help this future child in the height department, he or she will hopefully be blessed with their mother’s will and determination. Her smarts. Her courage. Her strength. Her gratefulness. Her beauty inside and out. And that breathtaking, wonderful smile.